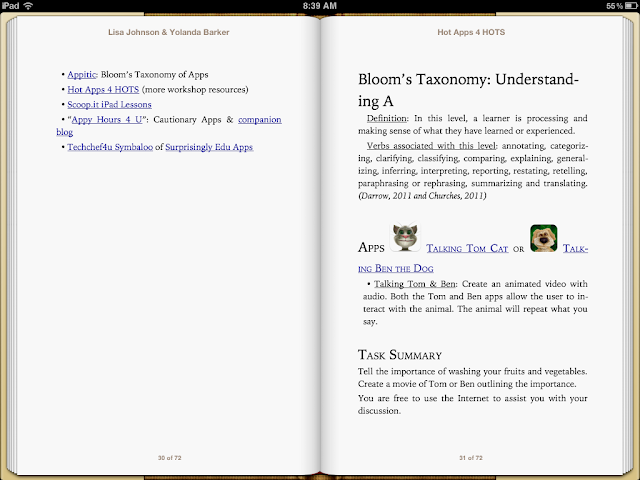 This ibook is really a supplement to the ideas and discussions they have on their Appy Hour Radio show. This is itself a fantastic resource and can be found at - http://www.blogtalkradio.com/search/appy-hours-4-you/. I love what these two women do - they give the rest of us the confidence to give it a go. More importantly they provide appropriate guidelines for incorporating iOS devices into our own pedagogy. With Lisa and Yolanta it is never about just giving the students a go on an iPad it is about embedding real and authentic learning by using appropriate apps. There is an constant evaluation of both the learning outcomes and of whether the apps build on the learning taking place. This is the one aspect the we all need to take away from this iBook. It is one aspect we need to implement into our own pedagogical reflections. 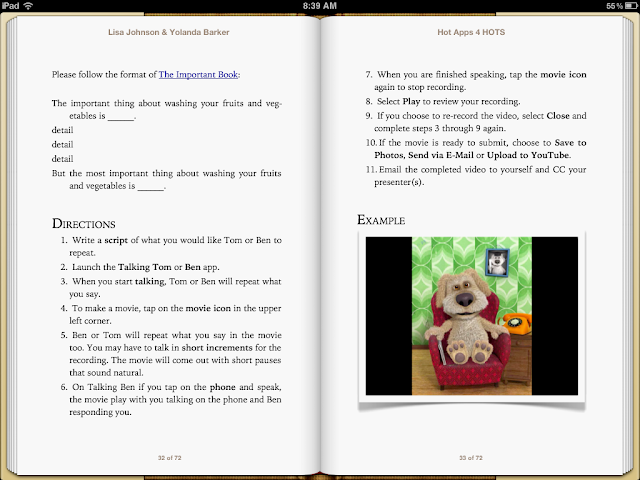 This publication Hot Apps 4 HOTS is another great example of incorporating multiple apps into a learning situation. Rarely would we use a single resource within a classroom, it is the same when you are using an iPod or iPad. We need to start looking at ways of designing learning experiences where students use a variety of apps to digest, to develop understanding and then to delivery evidence of their learning to a authentic audience. Make sure you also check out Lisa's blog Techchef4u. It is one of the places I go when I need ideas about using apps or when designing new units of work. There are some great existing lessons but again I think they provide a great blueprint for you to develop your own lesson ideas. This definitely now resource I will be sharing with my colleagues. I just wanted to post a comment about the blog entry that you wrote. I currently have eight iPads that I am trying to incoporate more and more into the classroom. I am a reading tutor and work with small groups of children throughout the day. Currently, each of the students in my class have access to an iPad so I am always looking for new ideas and more effective ways to use it as a teacher. Your blog has some amazing ideas. I especially like this post about Hot Apps 4 Hots. I have been inquring information about it but your blog clearly states its purpose. I agree that as teachers we need to find ways to incporporate multiple apps into learning situations. Thanks for all the information and I look forward to reading more posts. I just wanted to post a comment about the blog entry that you wrote. I currently have eight iPads that I am trying to incorporate more and more into the classroom. I am a reading tutor and work with small groups of children throughout the day. Currently, each of the students in my classes has access to an iPad so I am always looking for new ideas and more effective ways to use it as a teacher. Your blog has some amazing ideas. I especially like this post about Hot Apps 4 Hots. I have been inquiring information about it but your blog clearly states its purpose. I agree that as teachers we need to find ways to incorporate multiple apps into learning situations. Thanks for all the information and I look forward to reading more posts. Thanks for taking the time to leave a comment. Make sure you check out Lisa's site because this is what she does. She has the most beautiful lesson on 'Painting an sentence'. What is that site? Are there any other blogs that you reccomend I follow?